“Oh, United Hearts of Jesus, Mary and Joseph, prostrated at Thy Feet, we offer Thee the merits of the martyrdom of Saint Lucy of Syracuse, who poured Her blood for Thy love, defending with heroic courage and scorching love Thy Name and the Holy Catholic Faith. For the love that She had for Thee and for Her poured blood, we ask Thee, oh, United Hearts, answer our requests and grant that we correctly appreciate the lessons that the life of Your servant, Saint Lucy of Syracuse give us, in order that we fulfill Thy most Holy Will here on earth, that we may be worthy of praising Thee along with Her in the glory of Heaven. Amen. (SEER MARCOS TADEU): “My dear listeners, it is with great emotion that I tell you that it was exactly with the prayers that we will pray in this Chaplet, that I recentely got the miraculous cure of my friend and brother, Marcos Auggusto, my brother of the religious order of the Little Slaves of Mary of Peace, the cure of cancer. It was with these prayers that I prayed in form of a novena for two months that I attained his spectacular, extraordinary and miraculous cure, so they are miraculous prayers, they are very powerful prayers. Let’sl pray with a lot of faith, with a lot of love, a lot of trust these prayers, this Chaplet that certainly will attain for us lots and lots of graces and everything that we do not have merits to attain, asking the Sacred Hearts of Jesus that through the merits of the life and martyrdom of Saint Lucy of Syracuse, these Sacred Hearts of Jesus, Mary and Joseph will grant us many graces because that which we do not have merits to attain, Saint Lucy has. So, let’s pray our Chaplets with a lot of love, with a lot of faith, asking that truly Saint Lucy pray and intercede for us, together with the Sacred Hearts and attain for us from Them the graces that we need so much. Let’s pray, dear listeners. We contemplate Saint Lucy receiving Baptism, learning with love the mysteries of the Holy Catholic Faith and we learn from Her to meditate on the Word of God, the Messages from the Sacred Hearts and the life of the Saints, to be like Her, true Catholics and great Saints for God’s greater glory. “My beloved brethren, I, Lucia of Syracuse, Lucy, your sister, your protector, come today again to bless ye, to give ye peace and also to say unto ye: Follow Me by the path of holiness, seaking everyday give the world a true testimoney of authentic Christians, of sincere and fervent Catholics and of true children of God and of the Immaculate Virgin, so that thus, as I was, ye too are an intense, shining light for this world that walks in darkness. Sacred Hearts of Jesus, Mary and Joseph, look upon the merits of Saint Lucy of Syracue who poured Her blood for love of Thee on earth and who loves Thee eternally in Heaven. Hearts of Jesus, Mary and Joseph, graciously hear our pleas through the merits of the martyrdom of Saint Lucy of Syracuse. Saint Lucy of Syracuse, pray to God for us and give us peace. We contemplate Saint Lucy recieving the apparition of Saint Agatha at Her tomb in Catania, totally consecrating Herself to Jesus and to His Most Holy Mother to be only Theirs forever and we learn from Her to love God and His Immaculate Mother with all our heart and to serve Him with love for all our lives. “Be light, illuminating this world with your word. May it be like Mine: courageous, solid, true, undaunted, fearlness in the defense of the truth, in the defense of God’s glory, in the defence of your home, in the defense of your interests and of all that is of the Lord, so that thus your word, becoming a two edged sword cuts on both sides, in other words, quench God’s enemies, reducing them to inercia anda t the samt time cause good souls to be stimulated, encouraged and emulated (in pledge) even more to sanctify themselves and to become increasingly more pleasant to the Lord. (Saint Lucy in the Apparitions of Jacareí, December 2012). We contemplate Saint Lucy continuously living in prayer, in divine charity and being denounced as Catholic to the Prefect Paschasius before who She courageously defended the Name of Jesus ando f the Holy Catholic Faith amd we learn from Her the love of prayer and to Always defend, by words and deeds, the Holy Catholic Faith and the Holy Messages of the Sacred Hearts in Their Apparitions in Jacareí. “Be light, by your attitudes, by the acts of your life, seeking with practice to prove with acts that you love Christ, that you love the Immaculate Virgin, so that from all your faultless conduct, a mystical light of truth, of authenticiity, of sincerity and of holiness comes out and causes all men to recognize God's existence, the greatness of His Love and at the same time knowing the truth, they be freed from the slavery of this world, the slavery of Satan and of sin that nothing more is the slavery to the lie that, outside of God, far from God man can be happy. Satan's lie, Satan's work consists in this, make man think that putting other things in the Lord's place or loving them outside of the Lord, man can be happy. With this, Satan dragged crowds and crowds of souls along the centuries to the eternal fire from where they will never leave again and where they will suffer to the point of breaking their teeth for all eternity.” (Saint Lucy in the Apparitions of Jacareí, December 2012). Hearts of Jesus, Mary and Joseph, graciously hear our pleas through the merits of Saint Lucy of Syracuse’s martyrdom. 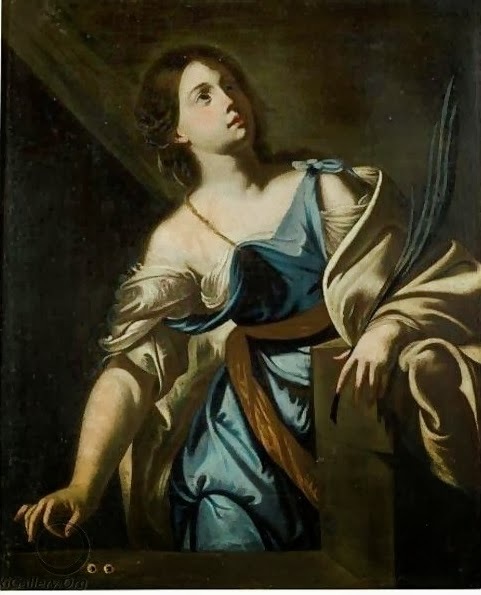 We contemplate Saint Lycy martyred, first by being burned alive, then pulled by soldiers and cars of oxen and finally having Her eyes cruelly plucked by order of the wicked Paschasius, heroically keeping the faith and love to Jesus. And we learn from Her the true love to God, the virtue of patience, faithfulness to Him in the sufferings of our life. “I invite ye, I invite ye to come after Me on the road of truth, becoming light for all those who lie in darkness. Take care of your soul, My beloved brethren, because the body already has a sure destination: it will be put in the tomb, in less than a week it will be completely eaten by worms and a short time after, there will be nothing left of it but bones and dust.. come after Me walking, therefore, on the way of prayer and of holiness because when one dies, from this world nothing more is taken than prayer and love. The warning is very near and when it happens, sinners will rip the hairs from their head, many will throw themselves in the precipices, while others will throw themselves in the bonfire closest to them. because they will see all the time of their life spent without God, offending God and working against God with their bad examples, sins, evil thoughts, words and actions. Therefore, I invite ye, to convert yselves now, immediately, hodie (today) as Saint Expidite said unto ye yesterday, so that thus, your life, at that time, is not a reason for remorse, despair and tragedy for ye, but rather is reason of joy, happinedd and of rejoicing, exulting in the Lord." (Saint Lucy in the Apparitions of Jacarei, December/ 2012)). We contemplate Saint Lucy dying with the stroke of the sword, pouring Her virginal blood for love to God, to the Immaculate Virgin and to the Holy Catholic Faith and we learn from Her the love to Christian Virtues, the true love to the Lord that is proven with deeds and prefering to die rather than offend God. “The great Chastisement will be worse than being cut more than one hundred time by fire, will be so terrible that those who will survive will incessantly call for death and on the other hand death will be their martyrdom, because from the fire and from the sufferings of this earth will be cast into the eternal fire that will never be extinguished. Therefore, convert yeselves, not for fear of the punishments, but for love of the Lord, for the holy fear of hurting Him and offending Him, May this be the mobile of your conversion so that it is pleasing to the Lord. Oh, Saint Lucy, martyr of love, we beg You, present Your merits united to our pleas to the Hearts of Jesus, Mary and Joseph, Whom we address in the name of Your merits, in order that They hear our prayers and deign to grant us the graces that we ask through You, along with the Crown of Eternal Life. May the blood poured for Your love to the Sacred Hearts, Oh, Saint Lucy of Syracuse, destroy the forces of hell in the world and deliver us from every evil. Through the merits of Saint Lucy of Syracuse, oh Hearts of Jesus, Mary and Joseph, save the world from ominous loss. Amen. (SEER MARCOS TADEU): My dear listeners, we have finished our Chaplet of Saint Lucy in the Name of the Father, of the Son and of the Holy Spirit. Amen. Until next time, God willing. Hail Mary! Hail Saint Lucy!